e-Phocus develops Photoconductor on Active Pixel (POAP) technology. The technology is based on coating of a CMOS chip with a photoconductive layer. e-Phocus’ image sensors are claimed to deliver an unprecedented price/performance ratio. It can provide the lowest cost for the required performance. I dont know why the cost would be lower if it still uses CMOS processing, but it's an interesting claim. Up to now I havn't seen an image sensor startup claiming to become the cost leader. The initial products are targeted to cell phone cameras and high resolution digital cameras (up to 40MP). So far the company is hosted by Trex Enterprises technology incubator. "E-boards can replace the white boards and beam projectors currently in use, with 100-inch or larger displays. To jumpstart the e-board market, the industry must secure technology for multi-touch screens and develop an image sensor that can be built into these displays to allow users to write on the displays in a way that is easy to read. We think this market holds great promise as a virtual 'cash cow' if we can provide e-boards with an interactive communications function that allows meetings and conferences to be more widely shared in real-time." The latest image sensor start-up company Himax Imaging is seed-funded by a large LCD driver vendor Himax, Taiwan. Himax Imaging is headquartered in Irvine, CA. Its technical lead, Dr. Sergi Lin, used to work for ESS and Biomorphic, both out of imaging business now. At least he had a chance to learn from their mistakes. Before that he worked for TSMC as a process integration engineer - an ideal experience for modern pixel designer. Himax Imaging's "pixel-centric design philosophy" is claimed to provide 4x sensitivity over "conventional pixels" (what is conventional? Nobody uses "conventional pixels" these days, listening to the marketing departments). Its first product seems to be based on 1.75um pixel. Tech-On: Sony developed a 3.5" VGA LCD panel with integrated image sensor for touch screen functionality. Based on the system on glass (SOG) technology using low-temperature poly Si, the photodetector is formed in the TFT array process. Some time ago Sharp and Toshiba-Matsushita reported about similar developments. Yahoo: Micron reports that sales of CMOS image sensors in the Q1 of fiscal 2008 increased approximately 15 percent compared to the previous quarter as a result of a higher level of unit sales. Seeking Alpha: Micron managed to keep ASP relatively flat as it migrates the business towards higher pixel densities. "With respect to imaging, as I said the last time, we don’t have any plans to change manufacturing the product. We’ve been looking at ways -- really, is there some other partnership that’s a better way to take that product to market after it’s been produced, so to speak, and we’re just still in the middle of trying to work through that and figure out what the best path is." In terms of product mix, just over half of the unit shipments were 2-megapixel and above, and by definition just under half were at 1-megapixel and below. Tower and CMT Medical form a partnership to develop and market X-ray detectors for medical applications. The detectors intended use is for Radiography/Fluoroscopy, Cardiology, Angiography, Mammography and similar large-size X-ray modalities. Large size detectors require the manufacturing of up to one die per eight-inch wafer. Delivery of the first Flat Panel Detectors is expected to begin in 2009. According to TriMark publications, a global leader in the biotechnology, healthcare and life sciences market research and intelligence, regarding the medical imaging market and according to FDA data, the number of new electronic X-ray detectors installed world wide exceeds 5,000 annually with a similar number of replacement and upgrade systems being delivered each year. At a price range of $35,000 to $80,000 per detector (based on dimensions), this represents an annual market opportunity of over $500 million per year. Potential future customers for the partnership’s products include the market leaders in medical X-ray systems, such as Toshiba, GE, Philips, Siemens and detectors market leaders. Tech-On: Itocuh Corp invested in Holochip Corp and agreed to a tie-up in the product development and sales. Holochip's liquid lens technology forms a lens by sealing liquid in a case made of transparent polymer membrane. The focal distance of the liquid lens may be varied by changing the shape of the lens with a horizontal forces applied from the circumference of the lens. Holochip's lens han have larger diameter than Varioptics and can endure wide temperature ranges. A lens installed in digital cameras, etc should withstand the storage temperature ranging from -40 to +85°C and the operation temperature from -20 to +60°C. EETimes: The International Imaging Industry Association Camera Phone Image Quality (CPIQ) Initiative enters Phase Two with objective to produce a complete set of standardized image quality testing metrics and methodologies, enabling a consumer-oriented image quality rating system. The group will focus on developing and validating test methods that have direct impact on image quality performance, along with a preliminary consumer-oriented rating system that will enable clear communication about image quality from vendors to consumers. Internetnews.com: Toshiba image sensor sales grew 45% this year, being one the the main sources for Toshiba's 27.8 percent sales increase in 2007, according to Gartner's "Worldwide Chip Sales" report. Digitimes: There has been growing adoption of extended depth of field (EDoF) solutions by image sensor makers to boost the acceptability of 3MP sensors in cameraphones, according to industry sources. Many CMOS image sensor makers are now trying to secure partnerships with the world's only two developers of EDoF software, DxO and Dblur, the sources claimed. The Digitimes sources forgot to add Tessera and CDM Optics-Omnivision to the list. Yahoo: Teradyne is to acquire Nextest for $325M in cash. Nextest Magnum iCP testers used to be the testers of choice for many image sensor companies. Now they become a part of Teradyne lineup. Planet82 pixel patent application has been published, so everybody can see what is its "Single Carrier Modulation Photo Detector (SMPD)" idea. Trying to avoid kicking the dead, I say nothing about it, but I wonder how they managed to convince IBM to spend its foundry time and effort to work on such a pixel. Vol. 50 of CX-News has an article about the Kumamoto Technology Center, Sony’s production site for image sensors. Sony intends to start mass production of CMOS sensors using 300mm wafers in a 5000 sq.m clean room in May 2008. One of the products to be produced on this line is IMX021 DSLR sensor. The 12.47MP sensor is based on 5.49um pixels. The sensor is able to operate at 10.39fps through its 12-channel LVDS output. Sony touts its column-level ADC as the biggest innovation in DSLR sensors. Yahoo: Finally Pixelplus disclosed that Sharp of Japan is its development partner for image sensors. Its PlusPixel2 technology seems to be based on Sharp's CCD pixel design. In Q1 2007 Pixelplus completed a co-development agreement with Sharp to jointly develop the enhanced PO5030 VGA SoC sensor (PO5030) and, in July 2007 it unveiled samples of its PO5030, which incorporates Sharp's 2.2um pixel design and architecture based on Sharp's CCD technology. Based on its co-development with Sharp, Pixelplus believes it will be in a position to furnish the PO5030 to module makers and mobile phone manufacturers beginning in the Q1 2008. "In moving forward, Pixelplus will expand its co-development with Sharp to include the 1.3, 2.0, and 3.2 megapixel SoC image sensors, as well as higher and more advanced megapixel SoC image sensors, featuring PlusPixel2(TM) technology and incorporating Sharp's pixel design and architecture based on Sharp's CCD technology." Yahoo: DALSA reported improvement in nose and QE of its CCDs due to "advanced fabrication techniques to realize smaller CCD transistor structures". The new "High Quanta" CCDs acheved QE peaking at more than 75%. The High Quanta family currently includes three sensors with resolutions of 2084 x 2084, 1044 x 1044 and 524 x 524 and feature a 24 um size pixel. For those applications demanding ultra violet (UV) sensitivity and > 90% QE, back side thinned (BST) devices will be available on a custom basis. Reuters: The Maeil Business Newspaper reported that Samsung was considering acquiring Micron's imaging business. A Samsung spokeswoman said the report was "groundless." Samsung also issued an official report denying the newspaper article. Officials at Micron could not be immediately reached. Associated Press via Yahoo details on the story origins: The Maeil Business Newspaper head earlier in the day cited an unidentified Samsung official as saying that the company may be interested in Micron's CMOS business to strengthen its non-memory business. Digitimes: Short supply of power amplifiers (PAs) hit the handset industry dampening the handset chip market. A weaker handset chip market has helped ease the shortage of VGA sensors, but that may not last long, the Digitimes sources said. The shortage of PAs is expected to ease by the end of the year and will rally demand for China's white-box handsets, the sources remarked. Tessera licensed its Eyesquad-OptiML focus enhancement technology to Toshiba. Micron seems to be the only large vendor with unknown plans (unknown to me, that is). Yahoo: TSMC celebrates one-millionth 12" 90nm wafer shipped in 4.5 years since the process has been introduced. The company PR says that "90nm process covers a rich set of technology options including ... CMOS image sensors... The technology platform supports broad range of market segment demand such as... CMOS image sensors". Now the question is when Omnivision and Kodak would demo 90nm sensors. Digitimes: HP has chosen Micron over Omnivision as a secondary CMOS sensor supplier as Micron is offering more competitive prices, according to sources close to Omnivision. Losing the orders to Micron does not suggest the solutions from Omnivision are inferior in quality, it was simply due to the aggressive pricing that Micron offered, the sources stressed. The order amount is not large, which implies any corresponding impact on OmniVision will be limited. Seeking Alpha published Omnivision's Q2 FY2008 conference call transcript. 1.75um pixel image quality is substantially better than the prior 2.2 micron pixel generation. Omnivision believes it's ahead of the competition in the development of 1.4um pixel. Mobile handsets accounted for approximately 65% of the Q2 revenues. The 2MP and higher resolution sensors approached 15% of total units last quarter. 1/4" 3MP is winning sockets at a very fast pace, including multiple tier 1 design wins. The total market for sensors in the notebook business will exceed 25M units in 2007, representing more than 25% share of all notebooks. TSMC remains by far and away the biggest supplier and Omnivision does not expect that to change at any time in the future. Powerchip is a development program which was originally intended and still is planned to deliver product in the second half of 2008. It's too early to tell how this will work. SIKOD presents Hynix history - a mix of ups and downs. Ups are attributed to amasingly good business practice, while the government helps it to survive during the down periods. Yahoo: Omnivision reported its margins improving in Q2 FY2008. Gross margin for the second quarter of fiscal 2008 was 25.2%, compared to 23.4% for the first quarter of fiscal 2008. The increase in gross margin reflects lower production costs and improved yields. Omnivision reported acceleration of demand for higher resolution sensors for developed markets, expansion in new markets and Emerging Products business improving. ISSCC 2008 published an advance program. It contains quite a lot image sensor related stuff. First, there is Imager Design Forum, almost entirely devoted to high dynamic range solutions. A multi-aperture imager sensor is designed to reduce lens requirements, produce 3D maps and improve pixel-defect tolerance. 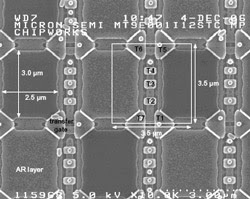 It comprises a 166×76 array of 16×16 0.7μm full-frame transfer CCD sub-arrays, a CMOS readout circuit and per-column 10b ADCs fabricated in a 0.11μm CMOS process. Snap-shot image acquisition with CDS is performed at up to 15fps. The array has 0.15V/lx·s sensitivity, 3500e- full-well capacity, 5e- read noise, 25e-/s dark signal, 57dB DR and 35dB peak SNR. A 2Mpixel CIS for mobile imaging applications has a pixel pitch of 2.2μm and is fabricated in a 0.13μm CMOS technology. The sensor uses a white-RGB color filter array instead of the regular Bayer pattern to improve the low-light SNR by about 3dB. The array also achieves a wide dynamic range by using charge skimming and multiple acquisitions. The dynamic range can be expanded by 8 while maintaining the improved SNR. A CIS with a hole-based pinned photodiode is presented. The detector reduces crosstalk by 3× and dark current up to 5× compared with an equivalent electron-based pinned photodiode detector. This technology is capable of full-well capacities of 60kh, 11kh and 4kh for 4.3μm, 1.75μm and 1.4μm pixels, respectively. A red-into-green pixel crosstalk of 7% is achieved at 650nm for a 4.3μm pixel, and the measured dark-current density is 25pA/cm2 at 60°C. A wide dynamic range 177×144pixel CMOS image sensor that can simultaneously capture both dark and bright objects in one synthesized frame has an analog accumulator within each 8μm pixel to synthesize a wide dynamic range image from multiple exposures. The sensor is capable of acquiring a 140dB dynamic range image at 15fps without external frame buffers. A CIS fabricated in a 0.18μm process with a 4T pinned-photodiode pixel and a buried channel source follower (BSF) is presented. Measurements confirm that the BSF reduces the dark random noise by more than 50% and improves the output swing by almost 100% when compared with a surface-channel NMOS source follower. Moreover, the BSF reduces the variance of the dark random noise distribution by minimizing the number of pixels that have RTS noise. Two CMOS imager chips are described. The first is a sub-retinal implant, being the only imager chip ever implanted into a human eye that partially restores vision to a blind patient. The second is a miniature imager chip, based on a thin-film-on-CMOS (TFC) pixel technology provides an optimum trade-off between sensitivity and pixel size. Yahoo: DxO Labs announced three embedded image processing solutions for camera phones, available as silicon IP. The three are the DxO IPE, DxO ISP and DxO DOP families. The DxO IPE family of solutions combines image processing with enhanced depth-of-field. The DxO ISP family provides image processing without the enhanced depth-of-field; and the DxO DOP family provides the enhanced depth-of-field without the image processing functions. All of the solutions are implemented using configurable and programmable SIMD processor core - sounds a lot like like NXP product. The solutions support resolutions from 1.3MP to 12MP. They are available to be embedded on CMOS sensor, on companion chips inside camera modules, or on baseband or application processor chips. The Korea Times: Hynix plans to start mass-producing the CIS products during the fourth quarter of 2008. By that time it should base its products on 1.4um pixel, if it wants to be on the forefront of the technology. To me, its hard to believe that Hynix is able to develop it in a so short time. If not, Hynix would compete on price with "me-too" 1.75um sensors. A year ago ProMOS had announced similar plans. However, it clearly takes them more than a year to come up with real products. Digitimes: It's official now. As many have predicted, Hynix signed a partnership agreement with Siliconfile. With all its recent advances, Siliconfile is probably too expensive for troubled Hynix to acquire outringht. So Hynix will acquire just a portion of Siliconfile's equity to strengthen the relationship. Hynix will manufacture and sell CMOS sensors using SiliconFile's design and will provide foundry services to SiliconFile. Both parties plan to cooperate on product development thereafter. Siliconfile projects that its annual sales to hit US$65 million in 2007, up from US$24 million in 2006. Siliconfile holds approximately 8% share of the mobile CMOS sensor market. It employs more than 40 experienced engineers, as Hynix said. It's impressive achievement for such a small team to capture so large market chunk. There are clear winners and losers in this marriage. The most immediate loser is Dongbu, the former Siliconfile's foundry. Dongbu has been with Siliconfile since its inception in 2002 and now it has lost its only big CIS customer. So Dongbu left with a significant knowledge in pixel design and ready to use image sensor IP blocks, like ISP. One can expect Dongbu would try to find some use for it. Hynix has found the best fit for its CIS program. I'm sure that Siliconfile will propel Hynix to the first league of image sensor manufacturers. However, it might take a year or so for technology transfer. It's probably too late for Hynix to enter to 1.75um pixel generation. I wonder whether Hynix-Siliconfile can provide a competitive advantage in 1.4um pixel. Siliconfile on its side can enjoy much more advanced process capability of Hynix, so its chances to design a competitive 1.4um pixel are not negligible. Robert W. Baird reports that Omnivision got a more favorable foundry agreement. Anybody knows what is this new agreement? Has Omnivision improved its contract with TSMC or switched over to other foundry? Yahoo: Samsung Mobile LCD Division has completed development of a flat panel X-ray detector (FPXD) for radiology machines using digital imaging with thin-film transistor (TFT) technology. To create its FPXD, Samsung attached photodiodes to a TFT substrate that was produced using its proprietary amorphous silicon technology. The X-rays are detected photon by photon and then converted into visible light, which in turn is converted to electrical signals. Samsung has created an image enhancement function which is claimed to eliminate most digital image noise interference to provide the highest radiographic sensitivity in the industry. The new FPXD measures 45 centimeters (cm) wide x 46cm high (or 61cm diagonally) and boasts a 3072 x 3072 (9.4 megapixels) resolution providing ultra-high definition images. The device will be available worldwide beginning first quarter, 2008. Globes Online reports that Advasense, Israel received investment from CIDC, Taiwan. The company PR states that the investment "will assist the company in accelerating development of its 5Mpixel 1/4" CIS product," which translates to 1.4um pixel size. Simultaneously Photonics Spectra published Advasense article named "Big Challenges of Small Pixels". Update: EETimes also published a report on that. "The MT9T111 shows marked differences from the previously analyzed Micron image sensor at this pixel size. It would appear that Micron has done some homework with this device because the new design has features similar to several other manufacturers that Chipworks has analyzed." As posted in comments to the previous story, Albert Theuwissen offers image sensor courses. Having talked to people who took his courses, I can attest that people find Albert being excellent lecturer delivering very useful and educational first hand information. Being in imaging for about 30 years, Albert went through all the CCD and CMOS generations and became a "living legend", so to say. I'm not affiliated with Albert in any way, to make this clear. Smart Robot Blog has quite a good collection of tutorials on machine vision and similar matters. Samsung made a local announcement in Korea that it has depeloped 8MP camera-phone module with AF and mechanical shutter. Probably it uses 1.4um pixel-based 8.4MP sensor announced in March. Caeleste and SensL jointly announce their collaboration on the design of an application specific ROIC (readout integrated circuit) for SensL's detectors. Reuters: Magnachip is planning an IPO of as much as $575M. It is seeking a NYSE listing under the symbol "MX.N". MagnaChip was launched after a consortium of Citigroup Venture Capital (CVC) in the United States, CVC Asia Pacific and another investment fund bought Hynix non-memory business unit for $830 million in 2004. It was initially aiming to file for an IPO in 2006 but delayed the move to 2007, citing stalled sales growth. In the latest quarterly report Magnachip says that Imaging Solutions sales were about $51.6M in 9 months of 2007 vs. $47.7M a year ago. The gross profit in imaging was $2.5M vs $5.3M loss a year ago. The increase in sales was primarily due to significantly higher sales of small form factor VGA products and, to a lesser extent, higher 1.3 MP product sales. CMOS sensors sales represent about 11% of the total company sales in the last quarter. Yahoo: DALSA announced the new family of 12um pixel AT CCDs: 4MP, 6MP and 12MP ones. The new FF CCDs are said to have higher QE, SNR and speed. Yahoo: High sensor demand from India, China and South American countries is slowing the decline in prices and margins, CIBC World Markets analyst Daniel M. Gelbtuch said. That could allow Omnivisions profits to exceed analysts' expectations. Gelbtuch added that competitors Samsung and Micron Technology Inc. are "playing nice." "Heading into 2008, we expect strong growth driven by extremely robust demand from developing regions, and tamer competition," he says. This might be coupled with the previous post on VGA sensors shortage. The bulk of Omnivision sales is VGA. Yahoo: Tower announced 2.2um pixel IP availability. The pixel is made in 0.18um process, which is quite an achievement for such a small pixel size, probably the smallest pixel ever made in that process. IBM and Kodak are known to work on something similar, but no official announcement has been made so far. The pixel is reported to have 1.5e/s dark current and 9e/s DSNU, both at room temperature. Very nice numbers. Unfortunately, Tower does not provide FWC, QE and crosstalk numbers to complement the picture. Several Tower customers are already developing new sensors using this new 2.2um pixel at various resolutions, ranging from very small VGA through 3MP sensors for cellular-phone applications up to 5MP for DSCs. Digitimes: Motorola is making massive purchases of VGA sensors resulting in a shortage on the market, according to Digitimes sources. Motorola is trying to boost its shipments in the last quarter of the year so that 2007 sales will end up more satisfactory. The shortage has not been helped by the fact that Micron has reduced its production of the component, the sources claimed. Micron earlier decided to cut production of image sensors because of decreased demand, the sources said. Artificial Muscle, Inc. will be demonstrating its newest SmartMove electroactive polymer platform product, the MLP-85. The MLP-85 actuator is a SMIA based auto focus actuator that is faster, more efficient, lighter, and more robust than alternative actuators. Philippe Kahn, CEO, Fullpower Technologies, Inc. Known to many as ‘the father of the camera-phone,’ Mr. Kahn presents the day’s opening Keynote Address entitled “Three Billion Camera-phones later: The Instant Visual Revolution.” One of the true creative geniuses of software technology, the founder of Borland, Starfish Software, LightSurf Technologies and his newest company – Fullpower – Kahn has been lauded by industry leaders and countless publications for his visionary strategy, technology innovation and his ability to drive an entrepreneurial culture. Kahn is considered one of the most innovative and dynamic leaders in the imaging and wireless businesses. I-Micronews mentioned some interesting 3D packaging news in the comments to the previous post. Oki announced it has started a contract assembly service for W-CSP image sensors using through-hole technology (ZyCube one?). In September, OKI established a volume production line for through-hole technology based W-CSP assembly at its production site in Tokyo and started operation in October. "Based on the through-hole W-CSP technology, manufacturers can make smaller camera modules, responding to trends such as the steadily shrinking size of mobile equipment," said Takaki Yamada, President of Silicon Microdevice Company at Oki Electric Industry. "We plan to increase the production level to 10,000 wafers per month within the fiscal year ending March 2009 and are considering increasing up to 20,000 wafers per month by the fiscal year ending March 2010". There was also Toshiba announcement on camera modules manufacturing plans. These modules are featuring an ultra small CSCM (chip scale camera module) that will be the first camera module manufactured with TCV (Through Chip Via) technology. Yole Développement published a market report on adoption of wafer level packaging in image sensors and other areas. As far as I'm able to understand, on the graph below the yellow color means R&D activity, while the red is production. So, by the end of this year we are supposed to see wafer scale packaged sensors from most of the major sensors manufacturers. Somehow I don't see this happens. Digitimes: Xintec, an affiliate of TSMC, has completed equipment installation at its first 12-inch wafer-level chip size packaging (WL-CSP) fab at the Hsinchu Science Park (Fab 3), and volume production is scheduled for the first quarter of 2008. To meet strong demand for CMOS image sensors from the handset and digital camera segments, Xintec already completed the capacity expansion of its 8-inch WL-CSP Fab 2 in the second quarter of 2007. The 8-inch fab now has a monthly capacity of 36,000 wafers, and it will continue to expand in the future, the company said. Yahoo: Kodak’s new Interline Transfer CCD technology platform will be the basis for a full portfolio of image sensor products targeted to markets such as industrial and scientific imaging, starting with the newly announced Kodak KAI-01050 Image Sensor. The 8th generation of Interline Transfer CCD technology developed by Kodak, this new platform reduces pixel size by almost 50%, doubles the maximum frame rate available from the image sensor, and provides a significant increase in image quality compared to the previous technology generation. The Kodak KAI-01050 Image Sensor is the first product to be commercialized using Kodak’s new Interline Transfer CCD technology. With a 1024 x 1024 array of 5.5 micron pixels, the sensor provides a readout speed of up to 120 frame-per-second in a ½-inch optical format. Engineering grade devices of the KAI-01050 are currently available, with volume production planned for early 2008. The Korea Times: Analysts interpret Samsung’s recent decision to buy TransChip Israel as part of the company’s efforts to confront global leaders in the sector. "We are also in the final stage of merger talks with two or three other overseas companies relating to the non-memory sector and hopefully the result will come out this year," Samsung's high-ranking official said, noting that intensifying competition pushes Samsung to have more mergers and acquisitions. Hynix, which recently announced a plan to promote its non-memory business after a three-year hiatus, will increase the portion of the business to 40 percent in terms of sales by 2010 by hiring more experienced workers in the CIS division. "By hiring more workers in the research-related, product design, solid state disk (SSD) and CIS divisions, we will accelerate efforts to escape from higher dependency on fluctuating DRAM chips," Hynix spokesperson Park Hyun said. Yahoo: Germany-based MGB Endoscopy Co. in partnership with AltaSens announces HD video camera for surgical endoscopy. The MD-V camera uses AltaSens' tapered reset 2462 SOC sensor delivering 60fps of 1280x720 video. Yahoo: DALSA announced that it has received a major contract to develop and deliver custom CMOS image sensors to a leading European digital radiography equipment manufacturer. The contract spans development and production activities over the next four years. The total contract is valued at approximately CDN $9.0 million. 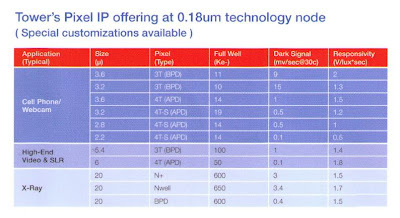 Yahoo: Pixelplus announced sampling of PO6030 VGA SOC sensor in 1/6.2" optical format. What is unusual in this chip is that it uses quite an advanced 0.13um process to make 3.6um pixels. The justification for this expensive process is probably a reduction in ISP size. 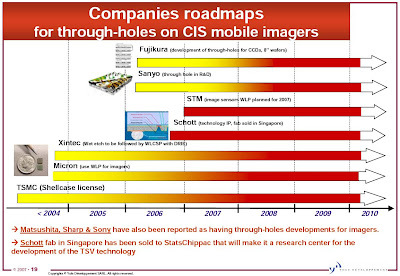 Tech-On: Tower's roadmap sees CIS pixel production at 1.7µm by 2008, and 1.4µm by 2009. Tower's advanced photo diode (APD) 0.18µm process delivers CMOS image sensors for fabless firms like Biomorphic Microsystems, e2v, Forza Silicon and Chinese firm SuperPix. The chips utilize Tower's pixel IP and optically optimized multilayer metallization, which "...achieves dramatically better optical sensitivity by reducing stack height from silicon to microlens. We recently developed a state-of-the-art 2.2µm pixel sensor for handsets and stills cameras, delivering high-density good-quality pictures at very competitive cost," said Rafi Nave, Tower's CTO. iSuppli's Q3 and Q4 2007 image sensor reports forecast the market shift from $5.5 billion and 1.14 billion units in 2007 to $4.7 billion and 1.91 billion units in 2011. This suggests ASP decline from $4.82 in 2007 to $2.46 in 2011. ASP declines are outpacing unit growth and the shift to higher resolution, more costly sensors. An increasing share for less expensive CMOS sensors is contributing to the overall ASP decline. The handset market will make up 53.5% of revenue in 2007 and 50.2% in 2011. For units, these figures will be 80.2% and 77.2%, respectively. Among other applications, the automotive market will undergo the fastest growth for CMOS sensors. Sony quitely released new CCDs: 8.15MP with 1.75um pixels and 12.19MP with 1.85um pixels. The ICX636/646 series which features 1.75um pixels, is said to use finer process features to increase the aperture ratio per unit pixel by 9% from the existing 1.86um pixel ICX629. It allowed Sony to achieve equivalent levels of sensitivity, saturation signal level, and smear characteristics as the existing ICX629 despite the reduced pixel size. Sony fast sensors family is getting bigger. The new Sony article describes 2.8MP 180fps sensor with about 3.5um pixel pitch. The 3T based sensor uses digital CDS, that is the reset level is stored digitaly and subtracted at the read time. All in all, it's quite a strange prototype in outdated 0.18um process and outmoded 3T technology. Toshiba is accelerating its planned 25% increase in CMOS image sensor production by roughly six months, augmenting some lines at its system chip plant in Japan’s Oita Prefecture to minimize the investment, notes the Nikkei daily. Meanwhile, Sony Corp. is planning mass production of 8-megapixel CMOS sensors by the end of 2008, in an effort to increase sales of the devices by 30% by fiscal 2009 to about 300B yen ($2.62B), reports the Nikkei daily. At the heart of the plan is a 60B yen (US $493.3M) expansion of its Kumamoto Technology Center (TEC) in Kyushu over the next three years. Can you give us an update on your CMOS business? I didn’t see much discussion on it within the MD&A. I may have missed it, but anything you can give. We made a few announcements about the processing -- you know, the progress we are making in technology. I think we make some public announcement about low-light capabilities which are fundamental. One of the objectives of our CMOS team is to make sure that eventually, we come with cameras that don’t need a flash, which as you know is one of the negating elements of a good digital camera and it causes a lot of trouble for color management and many other things, battery power and all of that. So we made a lot of progress there. We are working -- I think we said that we are working the large, volume product that you are going to see is going to be in a cell phone, and this is a project that we are working intensely with a leader in the industry, Motorola, and we will -- you will see the effect of that. And then the other one is in the fourth quarter, you are going to see, we just introduced it about a month ago, one of our digital cameras at very low-end that has one of our CMOS sensors. Again, this is a long cycle business. We have our plans there for volumes but the two places where you can see the CMOS business come into relative volumes is in our low-end digital camera and in the first and second Motorola phones. That’s what you are going to see. We are working on other deals but those are things that you are going to see soon. In 3rd quarter ended on May 31,2007 Micron's Imaging segment lost $17M. During the next quarter ended on Aug. 31, 2007 it lost $15M. Micron bumped up its Imaging segment R&D spendings from 9% of Imaging sales in Q3'FY2006 to 31% in Q3'FY2007. This translates to almost $43M per quarter, about $170M per year burn rate for Imaging R&D only. With such a huge R&D budget it's no wonder that image sensor business loses money. Now my question is how Micron can spin off this money bleeding business? And what business model can make these plans viable? Hynix news are trickling across the web. Bloomberg reports that Hynix seeks alliances for image sensor chips. "We will be trying to forge alliances with the major players in this sector," Hynix CEO Kim Jong Kap said in an interview in Seoul. It had been prevented from entering such businesses under a 2002 bailout, which led to a Citigroup Inc. buyout fund acquiring the Korean chipmaker's non- memory unit to help stave off bankruptcy. "To compensate for lost time, Hynix's likely option is to partner with a bigger maker or a fabless design manufacturer," said Lee Sun Tae, an analyst at Meritz Securities Co. in Seoul, without naming potential candidates. Reuters: Long rumored, it's official now: Samsung has bought Transchip, an Israeli image sensor vendor, in order to turn it into an R&D center. Samsung declined to publish the value of the transaction. "We are aiming to enhance our presence in the image sensor area," a Samsung spokeswoman told Reuters. This is Samsung's first foreign acquisition in the semiconductor area since 1997, the company said. Update: International Herald Trubine says that The Korea Economic Daily newspaper reported the purchase price was $70M. Digital Chosunilbo: Reborn as the Samsung Semiconductor Israel R&D Center, the company works on CMOS image sensors and has some 60 staff. Globes: Sources inform that Samsung plans to expand the R&D center, which currently has 70 employees, and might also expand its activity to new fields. Yahoo: Pixelplus sold approximately 4.2 million image sensors in the Q3 2007, which represented an increase of about 1.2 million units from its sale of around 3.0 million units in the Q2 2007. As in the previous quartery report, there is a mysterious "services" statement: "the Company provided approximately 2.2 million image sensors arising from its supply of services to a leading Japanese module maker". In terms of combined figures, the Company sold and supplied a total of about 6.4 million image sensors in the third quarter of fiscal 2007. Gross margin for the Q3 2007 was roughly 26%, compared to approximately 36% in the Q2 2007. The Company is fully focused and committed to obtaining a major design win to supply its PO4010 CIF SoC sensors for use in upcoming, high volume mobile camera phones of one of the world's largest mobile phone manufacturers based in Korea. PO4010 is currently in the final stages of testing and inspection by the Korean mobile phone manufacturer, and the Company is confident that it will be in a position to secure a design win in Q4 2007 and ship its PO4010 to that Korean manufacturer starting in the Q1 2008. PO4010 uses 0.13um process and features a 3.6um pixel - quite an interesting combination. Solid State Technology: This old article from January 2007 escaped my attention at the time. It's devoted to Korea semiconductor industry success stories. One interesting statement is that SiliconFile reports that its CIS devices have been designed into more than 70 handset models manufactured in Japan and in the Asia-Pacific region. Also, SiliconFile cites strategic relationships it developed with Samsung. Another examples of Korean success are ISP vendors Core Logic and MteK Vision, whose market capitalization in KOSDAQ have exceeded their paid-in-capital by more than 100 times. P.S. Oops, it was published in January here in the blog. Now we are starting to see the results of these design-ins in the market share. All these Hynix fears are very exaggerated, in my opinion. Even if Hynix becomes a strong competitor in the end, it has a very long road ahead. EETimes: "Given Hynix' history in memories, the company could turn the CMOS image sensor market upside down with potentially new and low-priced products, observers said." Personally I do not believe in this. "Me too" products unlikely change the market, while more distinctive imagers take a long time to develop. Jazz Semiconductor announced cryogenic models for its 0.18um and 0.25um processes targeted to cooled IR imagers readout designs. 0.25um process offers 3.3V CMOS while 0.18um process offers both 1.8V and 3.3V transistors. In addition to the core CMOS, the process supports poly resistors and linear MIM capacitors at densities of up to 4fF/um2. The CMOS cryogenic modeling library has been validated at temperatures of 78K to 298K through a wide range of DC and AC tests. Resistors and metal parasitic effects are also modeled at 78K, enabling full post layout simulation under cryogenic conditions. CNNMoney: Motorola Ventures announced that it has made an equity investment in Siimpel. Financial terms of the investment were not disclosed. This investment should allow Siimpel to accelerate the production of its MEMS based AF solutions for handset cameras. The Korea Times: Hynix says again that it intends to enter CIS market as a part of its strategical move away from DRAMs. "We will increase the portion of new businesses to a maximum of 40 percent in terms of sales by 2017. The start of the complementary metal-oxide semiconductor (CMOS) or CIS businesses is the first step toward the long-term goal," Hynix spokesperson Park Hyun told The Korea Times. Hynix once dominated about 50 percent of the market before selling MagnaChip, The Korea Times writes. "We cannot survive only with a focus on memory. So we urgently need to diversify our portfolios," Hynix CEO Kim Jong-kap said. Yahoo: Pixelplus announced that Dr. Sang-Soo Lee, the Company's CTO, Executive VP, and also a member of Pixelplus' board of directors, decided to depart the Company due to personal reasons. Sang-Soo Lee was brought to the company a few years back to improve technology positioning of the image sensor maker. I believe it's a bad sign that he left now. In a separate strange announcement Pixelplus says that it sold its Taiwan subsidiary stake to some unknown party. eMediaWire: Lyra Research published a market forcast on camera resolutions. The prediction is that by 2011 more than three-quarters of all digital cameras sold worldwide will have a resolution of at least 8MP. "Not only has the megapixel race not slowed down in the past year, it has actually accelerated," comments Steve Hoffenberg, director of Lyra's Consumer Imaging Intelligence. Yahoo: Cypress, Belgium continues to serve niche markets. This time the former Fillfactory team designed a very fast 500fps, 1.3MP sensor with huge 14um pixels. Most probably the pixels are based 3T technology. Digitimes: Len Mei, executive VP at ProMOS has said image sensors volume production should be ready during late 2007. Progress on CMOS image sensor development is good and ProMOS is optimistic about the role of DRAM makers in this segment in the future. Mei said volume production of the image sensors will start at ProMOS' 12" fab in Hsinchu, Taiwan, at the 0.13um node. The upcoming image sensor, named NPS, is targeted for digital camera applications, Mei said. An earlier Chinese-language Commercial Times report cited ProMOS as saying that high-end sensors will be fabricated at a 12" fab in Taiwan, whereas low-end models will be fabricated at the ProMOS' new 8" fab in China at 0.18um. Digitimes: Pixart reported that its image sensor inventory easing is being observed in the channel currently, and this is not expected to end until the fourth quarter of 2007. Demand from handset customers is steadily growing and sales should continue to serve as a key driver in the fourth quarter. Pixart noted that its sensor has gained orders from MediaTek, implying that its exposure in China is set to expand along with MediaTek's growing influence in the China handset market. Pixart updated that it is the first design house in Taiwan to introduced 4T image sensors. The sensor supports VGA resolution and shipments have been already started to China-based handset customers following volume production in the third quarter. Since Pixart uses UMC as a foundry, it means that UMC has mastered 4T pixel design, finally. Yahoo: Tower began manufacturing of a number of image sensors for Vision Integration Technology, Inc. (ViTi) in its Fab1. ViTi is a Taiwan-based semiconductor company that specializes in products for security and surveillance systems, primarily in the Chinese and European markets. iSuppli projects that the market for surveillance-camera semiconductors would reach $1.25 billion in 2011. ViTi uses 0.35-micron CIS process and employs Tower pixel IP. Digitimes: Private equity firm the Blackstone Group will invest in the Miceon CIS spin-off, although Micron will maintain control. The spin-off is expected to be finalized by the end of 2007 at the earliest, according to the rumors. I've just discovered Richard Baer's page with all his papers on-line. Among other things, there is hard to find stuff, like his ISSCC 2007 Workshop lecture on noise in a camera system and ISSCC 2005 Workshop presentation on ISO metric. Tech-On: Rohm exhibited a thin film multilayer image sensor at CEATEC Japan 2007. 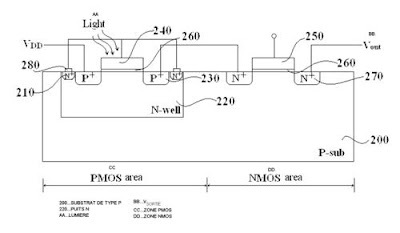 The major difference between Rohm's new image sensor and the existing CMOS sensors is that the former has a structure technically identical to that of a Cu-In-Ga-Se (CIGS) solar cell, instead of employing the existing Si photodiode. The CIGS photodiodes formed directly on an LSI chip. The sensor has 100K pixels, 10um each. Its QE for visible light is said to be approximately twice of that of crystalline Si photodiode. Assuming that good Si photodiode in large pixel approaches to 60-70% QE, I wonder how Rohm doubles that. The major remaining issue is how to miniaturize the sensor. The pixel in the latest prototype is a 10um. In the technology used for the latest development, grooves between the adjacent elements are made after the formation of CIGS layer. "We need to develop a more sophisticated technique to miniaturize the picture element blocks," Rohm said. Keith Fife was the key person in Smal Camera startup. He has many bright ideas and every his paper is certainly worth reading. 38.2 Development of a Production-Ready, Back-Illuminated CMOS Image Sensor with Small Pixels, T, Joy, S. Pyo, S. Park, C. Choi, C. Palsule, H. Han, C. Feng, S. Lee, J. McKee, P. Altice, C. Hong, C. Boemler, J. Hynecek, J. Lee, D. Kim, H. Haddad, and B. Pain, Magnachip Corp.
Backside illumination is the future of imaging, the only question is when this future becomes reality. Many companies look in this direction. It's interesting to see what is the pixel size that Magnachip was able to achieve. I'm eager to see the results of its sensors, such as pixel crosstalk in blue and image lag. I'm not sure why transistor count is important in X-ray sensors. The pixels are supposed to be big, it should be sufficient room for as many transistors as needed. The fact that Micron Imaging Division lost money in May quarter struck me. How come that IDM Micron with fully depreciated fabs and low wafer price lost money? Combine this with a rumor that another IDM Samsung lost money too in its image sensor business. And who is earning money? - Fabless Omnivision! To me this is another nail into a coffin of IDM's superiority myth. Yahoo: Micron announced MT9V023, 1/3-inch, wide-VGA (752 by 480 pixels) sensor. The sensor features near-infra-red capability and global shutter. Its speed is 60fps at full resolution. A new context switching feature adds a second register bank, so that two applications with separate imaging needs--like intelligent headlamps and lane departure warning--can operate from a single sensor on alternating frames. Improved HDR control extends the range of the sensor's knee points to adjust to images containing both brightly lit scenes and relative darkness, such as experienced when exiting a tunnel on a bright, sunny day. Micron is currently sampling the MT9V023 now, with mass production expected in Q1'2008. Vehicles equipped with this new sensor are expected to hit the roadways in mid-2008. Seeking Alpha published a transcript of Micron quarterly results conference call. Micron says that it's taking market share at the high end, evidenced with 5% quarter-over-quarter increase in sensor revenues despite a moderate decrease in unit shipment. Also Micron sees unforecasted "positive movements" in the low-end, which is VGA and 1.3MP. In May quarter the Image Sensor business lost money on an operating basis. The situation in the most recent quarter will be reported in K form later. Imaging business has been down, so no more DRAM capacity is converting to image sensors now. If the situation improves, the conversion process would start again. On imaging business spin-off side Micron says that it's still exploring the alternatives. In any scenario, Micron intends to continue to manufacture sensors at the silicon level, so spin-off would not include fabs. Regarding the sensors transition to 300mm wafers Micron responds that it would come eventually but not in the nearest two, maybe three years. Yahoo: Broadcom announces BCM2727 high definition mobile multimedia processor supporting 12MP sensor and 720p HD Video encoding and decoding with H.264 main profile. Its integrated ISP processes all the usual camera pipeline functions at speed of up to 144 million pixels per second, that is up to 12fps at 12MP resolution. The only thing preventing this processor from winning the mainstream is availability of 12MP mobile sensor. The current generation of pixels allows to do this in 1/2" format. Sould we expect such a sensor soon? Yahoo: New Omnivision sensor is packed with features: it has anti-shake and HDR functionality, single-lane MIPI and integrated ISP with jpeg compressor, all in 1/5" form factor. The 2MP OV2650 sensor is based on the new 1.75um pixel. The sensitivity is 520mV/lux-sec. HDR mode provides up to 85db of DR.
Digitimes: Toshiba starts mass production of new very small camera modules at Iwate Toshiba Electronics from January 2008. The ultra-small chip scale camera module (CSCM) that will be the first camera module manufactured with through-chip via (TCV) technology. The modules will be demonstrated at CEATEC Japan 2007 from October 2. TCV technology reduces wire bonding substrate area by mounting components directly on the wafer and running electrodes through the vias on the circuit board, securing them with balls of solders on the substrate. "The fill factor of SiliconFile’s ¼-inch 3M CISs no longer has the plain-old 4T architecture, and has increased from 30 to 60 percent through the propriety shared pixel of the company. Sensitivity degradation, which occurs in smaller pixels, has dramatically improved." "The company further notes, that as makers shrink the pixel size of their CIS products, enhancing resolution using low light has become a major concern. Hence, makers, most large companies, have developed a technology for processing less than 90nm." EETimes: Lazard Capital Markets analyst Daniel Amir expects Micron to give an update on its progress in separating its image sensor business during Oct. 2 fiscal Q4 earnings call. He added that he expects that business unit will be spun out in the first half of next year. EETimes: Tower Semiconductor is currently in talks with SemIndia and Hindustan Semiconductor Manufacturing Corporation (HSMC), two leading proponents of Indian chip manufacturing. Rafi Nave, Tower's chief technology officer, told that "Tower brings to the cooperation with the Indian companies an offering which includes special areas such as CMOS sensors." "We have already secured design wins with TrueFocus and anticipate meaningful revenue in calendar 2008. What we have learned from the handset maker, who continues to be very excited by these technologies, is that having the sensor and DSP functionality on a single chip is a critical requirement. We are already being announced on multiple projects to develop single-chip wafer encoding products." "We are seeing a dramatic increase in image sensor attach rates in the PC notebook market. We believe that the total market will be about 20 million to 25 million units in 2007 out of a total of 100 million laptops. This is a much faster attach rate than we originally anticipated. With design wins at four of the five leading manufacturers, we have a dominant market share." "We are currently working on 1.4-micron pixel size and beyond." "We are making progress with PFC in developing new processes and new products using their 300mm DRAM capacity. We expect to begin production on the larger wafers in the second half of calendar 2008. VisEra made further progress in their program to expand their capacity and to prepare their facilities to handle 300mm wafers." "Gross margin for the first quarter was 23.4% compared to 22.3% last quarter. Excluding stock-based compensation expense of $953,000 gross margin was 24%." "The question of whether or not you could really get margins back to the mid-30s I think is much more complicated. My short answer is that you really are going to have to develop some truly innovative products that provide you with a significant advantage over the competition." "The 3-megapixel sensor that we introduced in June on OmniPixel3 technology has a 1.75-micron pixel. We believe that that 1.75-micron pixel is at least as good as and possibly even better than any of the competitors' products. We are very comfortable showing that pixel off to any and all of our customers against any and all of the competitive products. So we think that we are right up there as a market leader in that particular important product characteristic." "There are no immediate plans for migrating to 300mm at TSMC." "We have a long relationship with PFC, but this is a new initiative for us and for them, and it is going to take a little bit of time to develop processes on the DRAM manufacturing process. Remember, our existing sensors are made on a logic process, so there is a lot of work to be done and we think that it is realistic to expect that we will get production in the second half of 2008, and that the economics of this [300mm DRAM process] will be very favorable." "It is very clear now that what we have to do is to integrate wafer encoding into the single-chip solution in order to make this a mass-market product." "We have already introduced the OmniPixel3 in our 3-megapixel product line, and we expect that to be contributing to revenues sometime by mid-2008." "Our [product] mix was roughly slightly above 70% for VGA, 15% for megapixel and above 10% for 2-megapixel." Reuters: Fujifilm said it intends outsource production of CCDs to Toshiba, dissolve its subsidiary Fujifilm Photonix and sell land and buildings to Murata. It plans to continue development and back-end processing of CCDs after front-end production goes out to Toshiba. About 200 Fujifilm Photonix employees will be transferred to a new unit that will handle after-sales services and back-end production, such as assembly and testing, of CCDs. The image sensor market is continuing to show strong growth with sales expected to increase by 14% to nearly $7 bn (€73.5 bn) by the end of 2007. European companies have regained some worldwide market share. In 2006, European-based companies were responsible for about 10% of the worldwide production of image sensors. The market share gain is mostly due to STMicro with its main customer Nokia. On the other hand, Micron with its main customer Motorola lost some market share. Fabless manufacturers are losing share to competitors that fabricate their chips internally. There is no convincing reason why an integrated strategy is fundamentally better than a fabless strategy – it all depends on communication and co-operation between the design team and the fab engineers. Even for integrated suppliers, politics and short-term priorities can overrule good engineering. Other important factors include the wafer sizes used in the fab, the skill of the design team and the strength of the patent portfolio. Either strategy can work well or poorly. Eric Fossum writes in dpreview forums: "I am hoping to get back to R&D soon. I finished my CEO assignment at Siimpel..." So CEO leaves Siimpel at the very moment when its first product reaches the market. It seems there is an interesting story behind this. Reuters: Sony is to focus on the production of strategic products such as image sensor chips. As a part of this new focus, it may sell Playstation 3 chip facility to Toshiba. Also, Sony cuts back on future chip spending and may not produce next-generation chips using 45nm circuitry in-house. EETimes adds that 3 strategic focus areas for Sony are imagers, game LSIs and system-on-chip LSIs for audio/video devices. Yahoo: NoblePeak Vision announced that it has successfully developed a single chip SWIR (short wave infrared) image sensor technology, TriWave, utilizing a standard wafer foundry CMOS process. TriWave is the first commercially viable technology that provides high resolution, zero blooming and high sensitivity over the visible to SWIR bands of the electromagnetic spectrum (450nm to 1650nm). Users will now be able to capture the atmospheric "Night glow" to provide visual images in zero light at an affordable price. TriWave uses two basic components readily supplied by Mother Nature: the atmospheric "Night Glow" and Germanium. The atmospheric "Night Glow" coming from bands of radiation 90km high in the earth's atmosphere which light up the earth at night and Germanium, a semiconductor element that is able to sense this short wave infrared (SWIR) night glow light source. TriWave is the world's first germanium enhanced CMOS image sensor that "sees" visible, near infrared and short wave infrared light to deliver the day/night camera solution. NoblePeak says the sensor has 720x576 array of 10µm X 10µm pixels and claimed to be scalable to higher resolutions. NoblePeak has been added to the image sensor companies list. Digitimes: VisEra, the joint venture between OmniVision and TSMC on CMOS image-sensor production, on September 11 announced the official operation of its 12-inch fab. Production of color filters will initially use 0.13- and 0.11-micron, and will later migrate to 90nm. The 1.8-hectare production hub includes facilities for the production of 8- and 12-inch CFs, as well as corresponding backend production facilities. Pilot runs are slated to complete in November with volume production to follow soon after. Yahoo: Joon Hwang, EVP in charge of the CIS Development for Dongbu HiTek said that only final reliability testing remains to be performed before qualifying the foundry's 110nm CIS process technology for volume production, and this will be completed over the next few months. Also, Dongbu HiTek announced the availability of a new design library to support the CIS processing at the 110nm node. The launch of the new 110nm CIS library follows Dongbu HiTek's April 2007 introduction of a 130nm CIS library. Both libraries are offered at no charge to Dongbu HiTek's foundry customers. DALSA announced 8-9% job cuts mostly affecting Colorado Springs facility. It looks like it were the last remains of DALSA-acquired Silicon Mountain Design. In 1999 DALSA paid $17.8M for SMD. Anobody knowledgable can comment on this? The dangerous asteroids search project Pan-STARRS uses 1.4 Giga-pixel camera. It's sensor is 64 x 64 array of CCD devices, each containing approximately 600 x 600 pixels. The individual CCD cells are grouped in 8 x 8 arrays on a single silicon chip called an orthogonal transfer array (OTA), which measures about 5 cm square. There are a total of 64 OTAs in the focal plane of each telescope. An Orthogonal Transfer Charge Coupled Device (OTCCD) is a device that allows for image motion compensation in the focal plane itself. During an exposure, selected bright stars have their positions rapidly monitored in order to calculate the immediate effects of atmospheric phase fluctuations. In a traditional "tip-tilt" adaptive optics system, these position errors are fed back to a small mirror whose angle is rapidly adjusted to compensate for the atmospheric disturbance. An OTCCD achieves the same goal by electronically shifting the image within the CCD itself rather than by moving a mirror. The read noise in the orthogonal transfer CCDs will be about 5 electrons and the sky background will be about 7 electrons per pixel with the broadband filter. Thus, sky noise will dominate read noise in exposures of 15 seconds or more. The immediate goal of Pan-STARRS is to discover and characterize Earth-approaching objects, both asteroids & comets, that might pose a danger to our planet. Pan-STARRS stands for Panoramic Survey Telescope & Rapid Response System. It is being developed at the University of Hawaii's Institute for Astronomy. In-Stat reports that in 2006, image sensors for camera phones comprised over three-quarters of all image sensors shipped. CMOS sensors dominated CCDs in units shipped in 2006. CMOS also made inroads into digital still cameras and camcorders in 2006, two markets that traditionally have been dominated by CCDs. CMOS sensors held nearly 80% share of image sensor shipments in 2006. CCDs continued to dominate the point-and-shoot sweet spot of the camera market. CCDs also remain strong in security cameras and camcorders. Sharp is approaching mass production of 3.5" half-VGA LCD display with a photodetector inside each LCD pixel. The resolution is stated to be 320xRGBx480. Due to the in-built image sensor the display can be used as touch panel and scanner. Sample shipments for this new touch screen display starts in September with mass production next spring. Gerra today also asserts that Micron “has a significant win” at Nokia for its image sensors which will ramp up next year. He says the company also has maintained its “stronghold position” at Motorola, including the RAZR2, and also continues to be a supplier to many smartphones, including the Apple iPhone. With yesterday's earning report and upbeat forecast Omnivision gets a lot of comments today. Marketwatch writes that average selling prices for Omnivision's sensor chips rose to $2, up from $1.92 for the three month period ended April 30, bolstered by a shift towards 2-megapixel products. It shipped 86 million sensors, up from 62 million shipped the prior quarter. "After a long struggle last year, market share gains, richer product mix and improving gross margin are finally trickling down to the bottom line," wrote analyst N. Quinn Bolton of Needham & Co. Some other analysts are sceptical, but my personal impression is that Omnivision overturn is for real. Finally Omnivision was able to deliver a good 2MP product and partially closed the technology gap in 1.75um pixel. No doubt this should improve the company market position. Digitimes: Adlink Technology, a Taiwan-based industrial PC producer, has been cooperating with one of the global top three suppliers of CMOS image sensor modules to develop an image sensor testing platform to be used on production lines. Adlink plans to start producing its testing platform in small volumes in Q1 2008. Richard Lyon's "Pixels and Me"
I've just bumped into a Computer History Museum's video lecture "Pixels and Me" by Richard Lyon (Foveon). Quite interesting historical content, if you have a spare 1.5 hour. One can download it here. EETimes: "The first half of 2007 has been a disaster for CMOS image sensor suppliers," said Robert Lineback, an analyst with IC Insights Inc. "This is mostly due to the decline of orders from the cellular phone segment. This correction continued in the second quarter, but market conditions should improve in the second half of 2007." In 2006, CMOS image sensor sales totaled $4.2 billion, up more than 30 percent from about $3.2 billon in 2005, according to IC Insights. The current outlook for CMOS image sensors is for only 4 percent growth in 2007 to $3.4 billion, after a year-over-year decline in the first half of this year, according to the firm. Overall, worldwide revenues for image sensors -- including both CCDs and CMOS image products -- fell about 4 percent in the first six months of 2007, according to the firm. "CCD sales have been down just slightly compared to the steeper drop in CMOS imagers, which have been clobbered with lower unit volumes and the erosion of average selling prices (ASPs) in the first two quarters this year," Lineback said. "Both CCD and CMOS image sensor segments are expected to improve in the Q3 and 4Q periods." Compounding the problem are some transitional issues in the market. "One major problem facing CMOS imager suppliers has been the slower-than-expected migration to higher resolution embedded cameras in handsets," IC Insights' Lineback said. "Micron continues to struggle with sensors and has not seen a rebound in orders from Motorola," said analyst Doug Freedman of American Technology Research Inc.
"We expect Micron to actively pursue strategic alternatives for its image sensor business," Freedman said. "While we don't expect Micron to exit the business entirely, we do believe the company is looking for ways to separate the image sensor results from its core NAND/DRAM business." Doug says that Omnivision ramps up a new tier one design win. "We suspect OmniVision's design win is with Motorola," he said. "Based on ASPs and volumes needed to generate the incremental revenue in OmniVision's guidance for the July quarter, we believe the company could be designed into the new Motorola Razr2 handset, which has the potential to be a key platform for Motorola in the coming quarters based on early user/industry reviews." Other CMOS image suppliers are seeing mixed results. "We believe pricing pressure in the low-end is still an issue with Samsung pushing for share gains," Freedman said. Like Lineback, Freedman also sees a better picture in the second half for suppliers. "Handset unit growth remains robust," Freedman said. "2-Mpixel sensors are becoming more mainstream with the industry moving from VGA straight to 2MP. We believe 2-Mpixel sensors carry a 2-to-3 times ASP advantage over VGA sensors and that advances in packaging technology will continue to push higher resolution sensors into mainstream phones and boost margins and volumes." Alexima announced its first sensor products. AM025 has 512x512 pixel resolution and 4000fps speed. AM40 is 4MP sensor providing 400fps. The sensors are clearly targeted to machine vision applications. The Korea Times: In July, Hynix CEO Kim Jong-gab said the company was ready to enter the non-memory semiconductor business. Officials say the detailed plans on the new business, including the repurchase of MagnaChip, will be unveiled after October 3. In 2004 Hynix separated from its non-memory business, which became MagnaChip Semiconductor. Bart Dierickx published his paper "Variability limits the advantage of a photo diode’s zero bias operation" on Caeleste web site. Originally the paper was presented at 2007 International Image Sensor Workshop, 7-10 June 2007, Maine USA. A few days ago Sony announced 12.47MP IMX021 sensor with 28.4mm diagonal, which translates to 5.49um pixel. At 10.39fps speed the sensor is quite fast for a DSLR sensor. Sony touts 12b column-parallel ADC, which allows "dual noise cancelling technology realizing high-precision noise reduction across both analog and digital circuits". However, no sensor noise numbers are released. IMX021 production will be carried out at Sony Semiconductor Kyushu Corporation's Kumamoto Technology Center. This is the old pixel from MT9E001 8MP sensor. It mostly inherits the first generation 2.2um layout, just shrinked down a little. More recent Micron pixels are supposed to improve its symmetry. Digitimes: ProMOS plans to provide foundry service production in the fourth quarter at its first 12-inch fab (Fab 2) at Hsinchu, Taiwan, according to the company at an investors conference. The company plans for a capacity of 20,000 wafer starts per month for CMOS image sensor production from the fourth quarter of 2007. From the article it's not clear whether this production relates to Toppan-licensed color filters or full image sensors. Vision Systems Design published an article about Jova Solutions' CMOS image-sensor and camera-module test station, the Image Sensor Lab ISL-1600, that provides a range of CMOS image-sensor interfaces and control, test, evaluation, and comparison capabilities and costs less than $5000. Image Sensor Lab application software includes many of the common high-level characterization tests typically performed on image sensors during manufacturing or verification testing, like photoresponse uniformity, dead- and defective-pixel detection, Macbeth color analysis, and MTF/SFR image-sharpness measurements, dust and particle detection and luminance uniformity. Another article by Toshi Hori, president of GEViCAM, gives a crash course on image sensor parameters interpretation. Quite simplified and incomplete, it might be of some use for those who new to image sensors. Taipei Times: ProMOS expects to start supplying CMOS sensors for customers on a contract basis in the first quarter of next year at the earliest, Ben Tseng, spokesman for PROMOS, said. ProMOS plans to make CMOS sensors at an old 12-inch (300mm) plant in Hsinchu, Tseng said, joining bigger local rivals such as Powerchip in making products other than DRAM chips at less cost-competitive factories. He declined to reveal the amount of additional investment needed to upgrade the facility to accommodate CMOS sensor production. Digitimes: SMIC, Toppan's partner in JV that produces on-chip color filters and micro lenses for CMOS image sensors, has said that it is glad to see the Japan-based partner licensing its technologies to Taiwan's ProMOS. SMIC maintained that its partnership with Toppan – the JV TSES in Shanghai – has been fruitful following the start of production in January 2006. ProMOS will in the future utilize Toppan's technologies for back-end production and services, SMIC added. Toppan and SMIC announced in June 2004 that they would invest US$64 million to jointly set up TSES, with the former having a 70% stake and the latter 30%. JCN Network: ProMOS moves full speed to aquire sensor production skills. Under the license agreement, Toppan will provide ProMOS know-how for the ramp-up of ProMOS's color filters and microlens production line at the 300mm wafer image sensor production line in Taiwan. The agreement will also enable Toppan to utilize ProMOS's production line for its production of color Filters used for 300mm wafer sized Image Sensors at ProMOS's established production line, and will also allow Toppan to supply the color resist to ProMOS. In other words, ProMOS gets excellent color filter and microlens technology, while Toppan gets access to 300mm wafer lines, that it previously lacked. This is what's called mutual benefit. Update: Digitimes writes that in addition to the technology license agreement, ProMOS and Toppan Printing will also extend the collaboration to a business partnership. The pixels are offered as IP for Tower CIS customers. The last 2.2um generation looks extremely good. With such pixels in hand fabless companies can effectevily compete with best sensors from Micron, Samsung and the likes. I'm eager to see the products based on these pixels. Okay. Antonio, I know it is still early days in the wake of the CMOS announcement, but based on your initial conversations, I’d be interested in your thoughts -- where do you see the opportunity with that product as I turn the dial? Is it selling co-manufactured chips into handset makers, is it licensing it to other chip manufacturers, is it putting it into your own cameras? I know it is some combination thereof, but I’m just wondering where you see, at last in the next 12 to 36 months, the largest opportunity based on your conversations so far? I think the largest is in the handset. As you know, we have a close relationship with Motorola. We are working diligently to help them develop improved cell phones with our CMOS sensors. I am anxious to be able to announce, for them to announce something like that. We are working very hard to get it to market quickly. That is the best opportunity, not just with Motorola but our plan is to serve anybody that is in the digital capture market. Having said that, we have one camera that is going to come with our CMOS sensors and we would like to see many more, and other people using our CMOS sensors, like today, some of our competitors, they use our CCD sensors already in their cameras, so we don’t see a reason why if we have the quality that we believe we do have and the differentiation that we believe we do have and the pixel technology and the imaging technology that we embed in those sensors, we should be able to get a good share of that market. Our tentative goal that we have shared with investors so far is that I don’t see a reason why we shouldn’t get to $300 million by 2010. If we hit it, well, it could be a lot more than that but that is the number that we are planning to for this purpose. Altasens Abandons "Tapered Reset" Technology? Broadcast Newsroom (link 1, link 2): In a surprizing move Altasense announced a switch to regular 4T technology. The pixel sizes are 2.09um and 2.7um for different sensors in the family - a very good start for the company new to 4T pixel design. The sensors are made in IBM's process. A5262-4T 5MP HD sensor is based on 2.09um pixel. It's designed for Hitachi’s Blue-Ray DVD/HD camcorder. It does 60fps at HD resolution and 30fps at 4.5MP resolution, both with 12b output. This is quite a unique combination for today's market. The sensor is at production ramp-up stage. A337x-4T sensors are based on 2.7um pixel and offer 72fps speed of 1080p HD video stream at 12b resolution. The engineering samples are available now. While transition to 4T is a very logical step for the company, it's a little bit sad to see that Altasens' pixel differentiation is lost. Yahoo: Omnivision's new OV7680 1/10" VGA sensor features a non-linear micro-lens shift technology. The technology reduces the distance between the sensor and the lens, so the height of the camera module can be just 2.5 mm. The sensor is based on 2.2um pixels. Omnivision already started shipping volume production quantities of the sensor. "The Company sold approximately 3.0 million image sensors in the second quarter of fiscal 2007, which represented an increase of about 1.8 million units from its sale of around 1.2 million units in the first quarter of fiscal 2007. Separately, the Company provided approximately 7.4 million image sensors arising from its supply of services to a leading Japanese module maker in the second quarter of fiscal 2007, which represented a decrease of about 0.8 million units from its supply of around 8.2 million units in the first quarter of fiscal 2007. So, in terms of combined figures, the Company sold and supplied a total of about 10.4 million image sensors in the second quarter of fiscal 2007, which represented an increase of roughly 1.0 million units from its sale and supply of around 9.4 million units in the first quarter of fiscal 2007." Gross margin for the Q2'07 was roughly 36%, compared to approximately 26% in the Q1'07 - excellent margins for relatively low-end product mix of the company.